A Current Affair last night took aim at My Kitchen Rules judge Pete Evans for his “obsession” of the Paleo diet. Evans, who is no stranger to criticism for his support of the diet, was described as “popular, polarising, unqualified and dangerous” based on Paleo cookbooks he has published. Professor Kerryn Phelps said fad diets, including Paleo, were unsustainable. “I think the claims are at best optimistic and at worst fraudulent,” she said. She played down some of the claims usually associated with the diet. “Remember those activated almonds? That’s when it all started going pear-shaped,” said ACA. The report questioned an online health course from the Institute of Integrated Nutrition in New York and his plans to release a cookbook for parents with toddlers, which was dropped by his publisher. ACA asked why Seven has not yet sacked the MKR judge. But Seven has previously stated he is returning to the role. But there have been wider questions in media and online about how Evans can endorse Paleo and remain an independent MKR judge. Evans was not interviewed for the report. Updated: Evans told KIIS FM’s Kyle & Jackie O today that he had never claimed Paleo was a cure. “I do find it fascinating that they’d use those type of words. I’d like them to be able to prove anything that they’re saying. If they can prove that I’m dangerous, then show me. If they can prove that I’m making outrageous claims, then show me the evidence,” he said. Ok, I’m not a fan of ACA or MKR (any more) but this is no different from the countless other shots across the bough at a rival network that ACA and TT have done before. It just shows that 6.30pm journalism is showing no signs of improving any time soon. This whole affair is just ridiculous. It’s a witch hunt started by the ACA. They have misquoted Evans on multiple occasions, and put experts on from one side of the arguments without letting others speak. I’m following a paleo diet myself, and I love it. I have lost a lot of weight and I feel much better in myself. I have much more energy and stuff. The point of the Paleo diet is, and I feel some people forget this, to not only diet, but to eat delicious foods at the same time. It’s the only diet I’ve come across that cuts out food groups, yet still focusses on everyone’s need to eat great food. I can say right now that I eat more varied now than when I started the diet. im not sure why 7 need to sack Pete. He is on a show that dominates its timeslot and I do like Pete. Its not like he sits there on the show and forces the diet down there throats and he still eats the food that is served to him. Its not a controversial diet and its up to the individual if they want to try it or not. Some people have had success with there health on this diet while others found they didnt enjoy it. I think ACA need to find another story. I don’t know how Tracey Grimshaw, being a great journalist, can continue to present this rubbish show, disguised as current affairs. I think she should get out while she still retains some credibility. No, no – you’ve all got it wrong. It’s not hypocrisy, it’s balance and fairness! 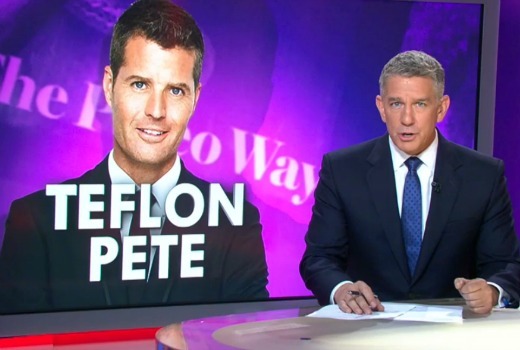 ACA have done uncritical stories about other fad diets so now they’re redressing that imbalance by having a dig at Palaeo Pete, who just happens coincidentally to be on a Seven show. Just like how they often run sensationalist smear stories about “dole bludgers” but recently got all faux outraged about how the participants were depicted in Struggle Street, another program that is coincidentally on a different network. First of all it isn’t paleolithic. Research on most paleolithic shows that diet contains a massive amount of unprocessed plant material and they ate meat only every few days when they caught something, not meat every meal. Dairy only became a major food source during the late neolithic. It may be a neanderthal diet during the ice age, but we don’t have much evidence to tell. A typical western diet isn’t good for gut bacteria, weight loss, blood pressure, heart disease or diabetes either. Cutting down on meat, dairy and eggs to eat more sugars, processed grains and seed oils causes its own problems. There is no conflict with his being a judge. He is a chef and knows how to tell restaurant food, including that which he serves but doesn’t prefer himself. Cricise the diet he is promoting by all means but trying to whip up hysteria to force Seven to sack him is wrong. ACA appeals to the absolute lowest common denominator of viewers. I cant believe anyone with half a brain would actually watch it. ACA are running a story about MKR simply because its a more popular show than ACA is. If it was another 7 show that was more popular they would run a negative story against that too. I don’t watch ACA regularly, but when I do stumble upon it, they always seem to have a story about the latest fad diet with some person spruiking their new book about it, with no questioning of the book’s medical or nutritional claims. So while I’m not a Pete Evans fan by a long shot, this does seem like blatant hypocrisy and network jealousy. Frontline may be gone, but its spirit remains. Nein gutter tactics again. That article in the Sunday Herald had a similar tone. Mongrels. How pathetic of ACA. It was nothing more than a cheap shot at Pete Evans, MKR, and Seven in general. What else could we expect from the Nine Network and their sad sense of entitlement. Agree with J Bar. just looks like more back stabbing from nine, jealousy is a dangerous thing, please nine grow up, don’t think you are doing your network much good with all this negativity and surely you can find more interesting and relevant stories for the viewers. Sounds like a Pete Evans character assassination dressed up as story on the Paleo diet. Another fair and balanced report from Ben McCormack I take it. This just looks like ACA has the obsession with Pete and MKR.